But they lean their head and arms a bit so obviously a cork. But yeah, when you can tell somebodys trying to cork but doesn't even hit 5 degrees. What should the cutoff be for calling something cork? I'm voting for 50 degrees off axis or more, and it must clearly come back around. john18061806 What should the cutoff be for calling something cork? We stopped being able to take the moral high ground on calling tricks when everyone started calling wackflips "flat 3" back in like 2008. We live in a world where people are allowed to "identify" their tricks as whatever they want. It's a free for all now. Awesome throwback to the days before doubles when you'd get called out for mis-calling tricks. A cork is a off axis spin that is leaned back, but so that the rider does not go inverted at any point. It is a popular trick, and many pro’s and amateurs do these very well. A forward corking non-inverted spin. Note the lean the rider has forwards at about 360. Also, see CR Johnson in SM2, SM3 or Propaganda, he does them best. Set the same way a cork is, but is more leaned back. A d-spin is essentially any cork where you become inverted. In all of these videos note how the feet will go above the head. Evan Raps does these very well, also see Mike Douglas. 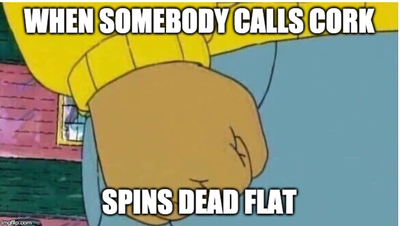 Flatspins are very close to rodeos. They are thrown almost the exact same, but the difference is that in a flatspin, the rider never gets completely inverted. Heres a way to think about it: A line extending through you from your head to your toes when you stand up. In a rodeo, this line ends up completely inverted at some point (although your feet can be somewhere else, like leaned back in a tail or a mute or something) while in a flatspin, this line never reaches true vertical. The line between what is a rodeo and a flatspin is understandably very blurry, especially when one considers tweaked grabs and such. Candide, Raps, and Mike D have the best d-spin in the game. TWoods We stopped being able to take the moral high ground on calling tricks when everyone started calling wackflips "flat 3" back in like 2008. We live in a world where people are allowed to "identify" their tricks as whatever they want. It's a free for all now. Lol I remember when triple corks were the big controversy. The first one I remember was Bobby Brown in Grand Bizzare, but I'm sure there was one before that? what really bugs me is when gymnasts call a cork 7 a "back full"
Also, Whole diffferent can of worms.. but a backflip with a cocked head is not a flat three. argue with me, but you're wrong. do a flat based 9 or 10, no cork. Its harder than cork 9 & 10 and harder control. New precedents says that single corks should be called by their rotations, and double corks as dub followed by their rotation. Official discretion is given to the viewer, not the skier. any spin with grab is cork, corks for all! big.love do a flat based 9 or 10, no cork. Its harder than cork 9 & 10 and harder control. "PLEASE REFER TO MY TRICK BY MY PREFERRED AXIS IDENTITY"
"The skier does one distinct off-axis or inverted horizontal rotation. At no point should the skier’s feet be above their head." The video isnt even level. straighten out the horizon line and he is in fact corked with his head almost at the same plane as his feet. freeskibum82 The video isnt even level. straighten out the horizon line and he is in fact corked with his head almost at the same plane as his feet. wait so now we're yelling at people for getting TOO corked? Let’s agree to disagree on this one, interpretation is subjective anyway (so is the definition of a cork these days). What’s the limit of invertion on a cork then? Is there even one? When does too much cork stops being a cork and becomes something else. BrawnTrends Let’s agree to disagree on this one, interpretation is subjective anyway (so is the definition of a cork these days). You're talking about a pretty rare situation with even a more rare outcome, getting nit picky about an off axis 540 is ridiculous. eheath You're talking about a pretty rare situation with even a more rare outcome, getting nit picky about an off axis 540 is ridiculous. It’s more a general question, the screen grabs were just examples because I had it in mind (just like Colby’s cork 6 out I just saw in his game an hour ago). I’m sure there are many more examples. Speaking of Colby’s Game... Interesting call from Woodsy on Taisei’s cork 6, completely on topic with the general discussion here. Was it really a cork? BrawnTrends It’s more a general question, the screen grabs were just examples because I had it in mind (just like Colby’s cork 6 out I just saw in his game an hour ago). I’m sure there are many more examples. I wouldn't have given taisei the cork 6 out, he just slightly leaned his body while grabbing. What cobly did was a very proper cork 6 out. New definition for cork in my book: it's corked if the inside shoulder is dropped on the set and at some point in the air the rider is off-axis enough that they would be absolutely screwed if they hit the ground in that position.